A wyvern or wivern (pronounced /ˈwaɪvərn/) is a legendary winged reptilian creature with a dragon's head, the hindquarters of a snake or lizard with two legs or none, and a barbed tail. The wyvern was often found in mediaeval heraldry. The word is derived from Middle English wyvere, from Old North French wivre "viper" Wyverns are mentioned in Dante's Inferno (Canto XVII) as the body for one of his creatures in hell. The wyvern is a frequent mascot, especially in Wales and Wessex, but also farther afield in Herefordshire and Worcestershire, as the rivers Wye and Severn run through Hereford and Worcester respectively. For example, one of the local radio stations is called Wyvern FM. Vauxhall Motors had a model in its range in the 1950s called the Wyvern. The Westland Wyvern was a British single-seat carrier-based multi-role strike aircraft built by Westland Aircraft that served in the 1950s, seeing active service in the 1956 Suez Crisis. The wyvern is also a frequent mascot of athletic teams, particularly in the United Kingdom and United States, and is the mascot of the Korean Baseball Organization team SK Wyverns, established in 2000. 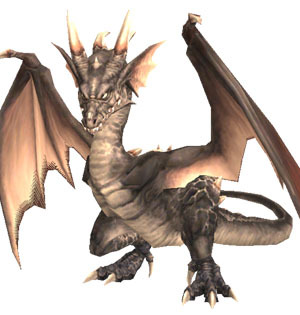 Wyverns frequently appear in video games, such as in the Warcraft series, the Monster Hunter series, the Kingdom Under Fire series, the Fire Emblem series, the Dragon Quest series, and the Heroes of Might and Magic series. Wyvern is also used as a name for a supercarrier class capital ship for the Caldari race in the MMORPG EVE Online. In the Disney cartoon series Gargoyles, "Castle Wyvern" was the ancestral home of the Scottish Gargoyles, who bore some resemblance to the mythical creature.